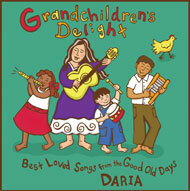 This Grammy-nominated CD is full of best-loved songs from the “good old days”. Also a 2008 Parent’s Choice Winner, this CD offers as heaping helping of family fun tunes on guitar, dulcimer and homemade instruments such as washboard, spoons and jaw harp! Bring out your favorite instruments and play or song along! 02. Do Your Ears Hang Low?